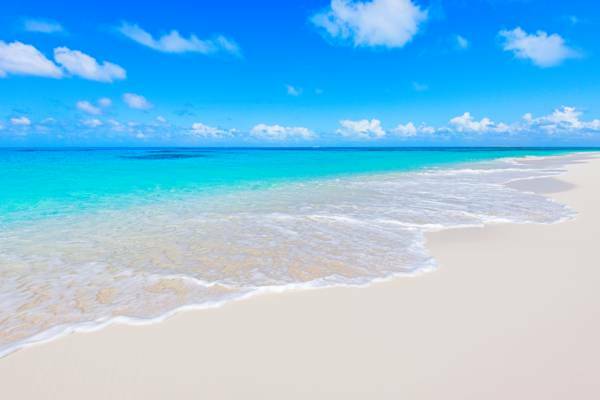 The incredible North Bay Beach, Salt Cay. 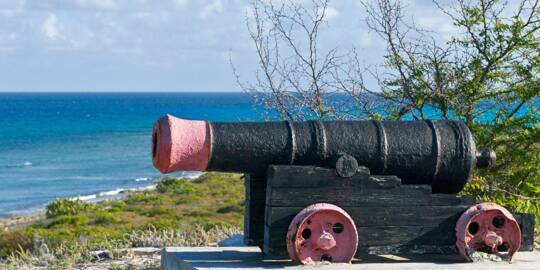 Late 1700s cannon at Little Bluff Lookout on Salt Cay. Salt Cay is the smallest of the main inhabited islands in the Turks and Caicos. With an area of only 2.6 square miles (6.7 sq km) and a population of only 108 people, this island has a completely different character and persona than Providenciales and the other islands in the country. Located on the south-eastern edge of the Turks and Caicos, Salt Cay is directly exposed to the constant tradewinds and bears a unique weather-beaten landscape. Salt Cay is truly an example of an island time forgot. There’s simply none of the tourism development, all-inclusive resorts, luxury hotels, spas or golf courses that define so many of the other Caribbean destinations. 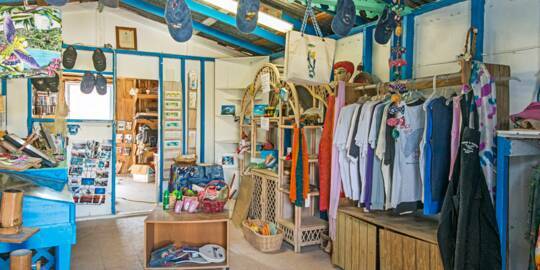 Three small restaurants, specializing in fresh seafood, complete the island's dining scene. Day to day life is quiet, there are no paved roads and very few cars. From landing at the tiny and quaint airport (a perfect reflection of the island) to the stuccoed limestone block colonial buildings in Balfour Town, the entire Salt Cay experience is unique. Tranquillity is an attraction in itself on Salt Cay. The secluded North Bay on Salt Cay. Salt Cay is the perfect vacation destination for those who love to get out and explore. For such a small island, there’s a surprising variance of beaches and coastlines to discover. Many coasts rarely see visitors, so you’ll likely have the beaches, bluffs, and hills to yourself. The spectacular North Bay Beach, with crystal water and white sand, is everything one could want in a tropical beach. Underwater here is beautiful too. Small and colourful snorkelling reefs contrast against the clean sandy bottom at several spots. The east coast is a bit more rugged. Low cliffs, boulders strewn by previous storms, and the flotsam-covered Long Bay Beach offer a different aspect. When the ocean swell is up, impressive waves can be seen rolling in. For those who’d like an entire tropical island to themselves, several beautiful and uninhabited cays, complete with pristine beaches, are found near Salt Cay. A day tour boat trip is the perfect way to discover paradise. For birdwatchers, the mangroves and waterways of South Creek are a haven for herons, egrets and ospreys. The Harriott White House and salt ponds, Salt Cay. As the island’s name suggests, sea salt has played a major part in the history of Salt Cay. Although one of the smallest inhabited islands in the Turks and Caicos, Salt Cay was the site of a historic change in the country’s progression. After the initial discovery of the archipelago by Europeans in the late 1400s, the Turks and Caicos largely remained uninhabited until the 1600s, when colonization and sea salt collection began on Salt Cay by the Bermudians. It wasn’t long after this point in time that our other islands began to be settled. 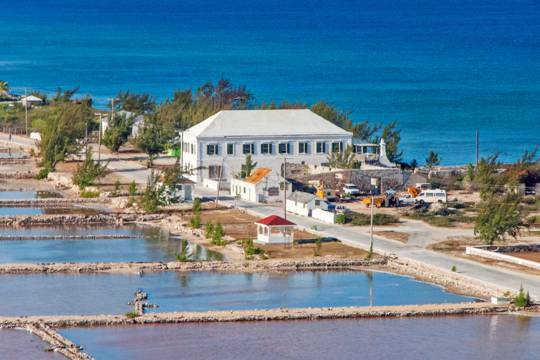 The main settlement of Balfour Town was established in 1673 by Bermudians when they began developing the natural and shallow saline ponds into commercial salt salinas worked by salt rakers. The revenue from salt exports continued to be the sole drive of the economy of the island for about 250 years, until the industry eventually declined in the early 1950's. Today, there are historical sites located across Salt Cay. Low stone salina walls, channels, gates, and the remains of windmill pumps still tell the story of this bygone industry. Hardy island donkeys and cattle, decedents of those worked during the salt days, still roam freely. 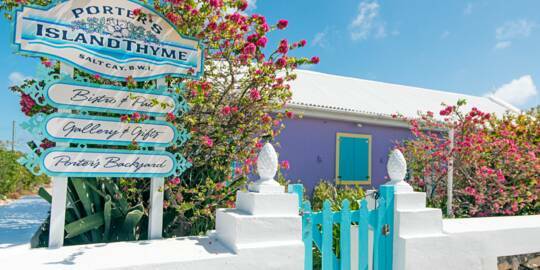 The Harriott White House, Salt Cay’s iconic edifice to the salt days, offers some of the finest British-Bermudian colonial architecture still remaining in the county. The salt industry remains and the ecological value of Salt Cay has led to the island being considered as a UNESCO World Heritage Site. Other centuries-old buildings, including The Halfway House and The Brown House, have been refurbished as accommodations. 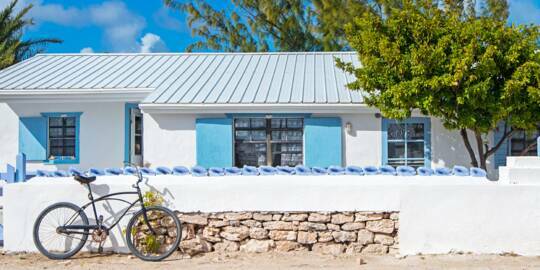 The Purple Conch Cottage in Balfour Town on Salt Cay. Salt Cay doesn’t have any hotels or resorts. Keeping with the laid-back atmosphere, all of the accommodations on the island are boutique villas or guest houses. There’s a wide selection of vacation rentals to choose from when planning your trip. Book modern villas, little beach bungalows or old colonial houses. Reservations and bookings typically take place directly with the lodging’s owner or manager, ensuring the best rates and service. Accommodation amenities often include the complimentary use of bicycles, an excellent way to get around the small island. Packages for scuba diving enthusiasts are available as well, and include dives, accommodation, meals, and the use of bicycles or golf carts, all under one price. Whether you want to explore Salt Cay for the day or a week, this little island is the perfect place to unwind and relax. Lounge on the beach, dive, snorkel, take photographs, or hike. Discover the old Caribbean. 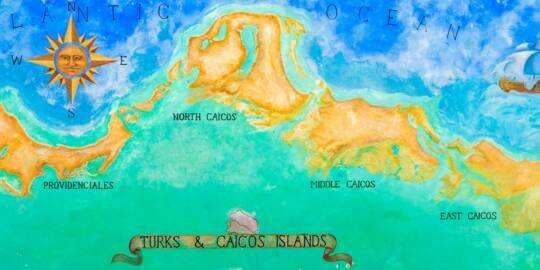 The vibrant Turks and Caicos reefs. Salt Cay's main claim to fame today is its exceptional scuba diving. The sheer wall dives, where the barrier reef drops from 40 feet (12 meter) into the thousands, are some of the finest in the region. Coral, sea fans, and sponges are vibrant, and fish, stingrays, turtles, and sharks abound. Many sites are found only minutes from shore, so you won’t have to endure long boat rides before you dive. Snorkelling is excellent as well. There are many interesting shore sites to enjoy, and boat snorkelling trips allow access to spectacular reef sites. Humpback whale off of Salt Cay. Ocean topography makes Salt Cay a prime location for watching humpback whales during the southern leg of their annual migration. During the winter months, Atlantic humpback whales travel to the warm waters of two subterranean ocean banks found to the southeast of the Turks and Caicos, the Silver Banks and the Mouchoir Banks, to mate and give birth. Due to the deep Columbus Passage that separates the underwater Turks Islands plateau from the Caicos Islands plateau, whales are naturally funnelled past Salt Cay. It’s possible to see whales from land, but a whale watching tour allows for a much better view. Unlike many whale tours at other destinations, small boats (the same vessels used for diving) are favoured. These low-impact boats are able to approach close without causing disturbance. The highlight of a whale sighting is an in-water snorkelling encounter. One of the few places in the world that allows this practice (with warm water too! ), it’s an unforgettable experience to swim with wild whales in their natural environment. Due to weather conditions, the mood of the whales and other considerations, there’s no guarantee that you’ll be able to jump in and snorkel. However, the opportunity usually presents itself. The humpback whale’s mysterious song can often be heard when diving or snorkelling at this time of the year. Exploring Northeast Point on Salt Cay with an off-road cart. The transport options on Salt Cay are a little different that what’s commonly seen at tropical destinations. 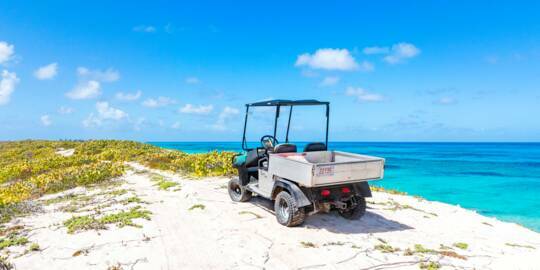 Due to the island’s limited size, off-road golf carts are the favoured way to get around. The free use of golf carts is included with some vacation rentals, and the carts may also be hired as well if you’re visiting for the day. Bicycles can be a good way to see the sights as well, and are available to rent. There are no taxis, buses or rental cars. When making reservations for your lodging, inquire what transport options may be complimentary. Three small restaurants are found on Salt Cay. Coral Bar and Grill and Porter’s Island Thyme serve international favourites and feature bars, and Pat’s Place in South District specializes in authentic Turks and Caicos cuisine. 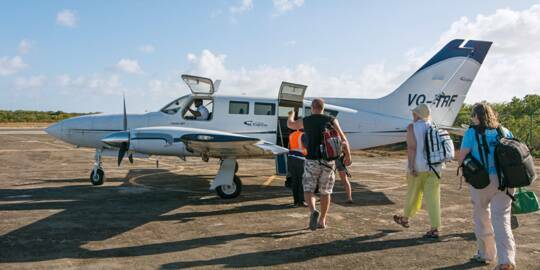 There are no direct international flights to Salt Cay, so it’s necessary to take a domestic flight or ferry from either Providenciales or Grand Turk. There are several regularly-scheduled routes to choose from. The exquisite North Bay Beach on Salt Cay.